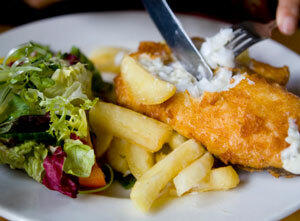 This great family restaurant and pub offers traditional English country cuisine. A large menu offers dishes like a variety of steaks, pastas, platters, burgers, pies, seafood and much more. A special kids menu is also available. A good wine selection complements the food and take-aways can be ordered. If you want a relaxed, laid-back hassle-fee dinner with great food, try Boompa's Kitchen.